This time last year, we posted a blog about setting goals for 2018, so we thought, why not do the same for the upcoming New Year? You may be thinking, "The holidays are around the corner; I don't have time to think that far ahead," but at least take a few minutes to contemplate our suggestions...and then make a note to get back to them at the end of the month. At the very least, your mind may start working on them while you're finishing up your seasonal errands and chores. 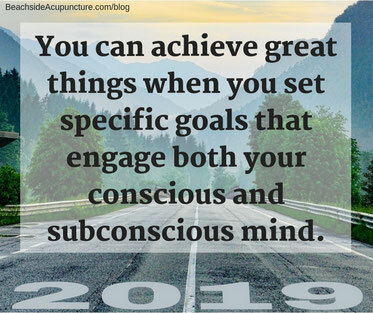 As we mentioned before, by writing down goals you set yourself up for success as your mind will start noticing opportunities that may not have caught its attention previously. While the classic S.M.A.R.T. method in which you choose goals that are specific, measurable, attainable, relevant, and time-bound ensures accountability, it is more analytical in nature, activating the conscious mind but not tapping into the subconscious, which is motivated by emotions and pictures. To get both parts of your psyche working together, consider adding evocative pictures to your goal sheet or creating a vision board to accompany your list. Take weight loss as an example: Say you want to lose 15 pounds for a family event in March of 2019; what would your goal look like when broken down? Specific: Yes, you have a definite number in mind and can easily make calculated changes in your diet and exercise program to produce results. Measurable: Yes, there are many ways to keep track of how much weight you've lost, and you can even have check-ins every other week to see your progress. Attainable: Fifteen pounds in three months is five pounds a month, which is very reasonable! Relevant: This isn't a random pie-in-the-sky dream; you have a specific event that is important to you. Time-bound: You've set an end date and can time milestones accordingly along the way. Emotions: You can visualize walking into the event fifteen pounds lighter, how it would feel to hear others comment on your accomplishment, having more energy to play with the children there, etc. Pictures: Photos of family members that will be there can be pinned up next to your tracking sheet so that you can glance at them and remember the warm visions of seeing everyone again as your "new self". Can you see how much more empowering this goal is than simply making a resolution of, "I want to lose weight in 2019." When you follow the steps above, you know you're on the right path to accomplishing your aim, and even though we chose weight loss here, you can apply them to anything. So, what do you want to do in 2019? Save up to travel, start a new business, pay down debt, learn a new language...? 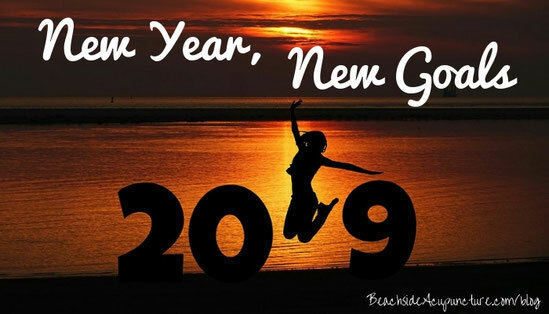 While goals can be set at any point, there's something special about the New Year, and now's the perfect time to meditate on what you'd like to see in your future. When you really think about all of the possibilities that are available, it's very difficult not to get excited about what's to come, so whenever you get the chance in the next few weeks, find a quiet space to reflect on 2018 and envision your next year. We can't wait to see what you discover!